Turnkey engines are complete motors with all new fan shroud, sheet metal, carbs, generator, distributor, coil, fuel pump etc. They do not include clutch kit, heater boxes or exhaust systems. Those components are available at additional cost in our Accessories section . JCS is an authorized distributor for all the major parts manufacturers like EMPI, Mahle, DPR, CB Performance, Engle, Kennedy, AA Performance etc. JCS has been in the VW engine and parts business since 1985 and at our present location for the past 10 years. We have a fully equipped facility in Irwindale, So. California and all welding and machining operations except for crank and cam shaft grinding are done in house. 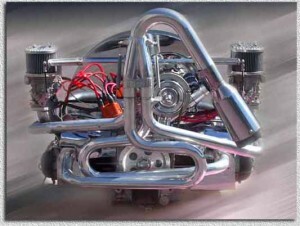 JCS uses the best reasonably priced components available to build your engine. Wherever possible we try to use original German cores. The best quality both in material and workmanship originally came from Germany. Brazilian and Mexico VW OEM parts while adequate are a compromise both in material and craftsmanship. Now that Brazil and Mexico no longer produce the VW air cooled engine many replacement parts are coming out of China. At JCS we stand behind our products regardless of where they are manufactured. We offer reasonably priced engines and components that the average person can afford to buy. We offer many options and upgrades for those who’s budget allow for higher priced performance enhancing components. Our new Magnesium or Aluminum cases, 4340 chromoly crankshafts, Big valve cylinder heads, H Beam connecting rods, Engle or Web camshafts, Chromoly lifters, Forged aluminum pistons etc. are the same as those offered by other more expensive builders. JCS buys in bulk, volume quantities which allows us to be extremely competitive with other builders. Listed below are the most popular engine combinations that JCS has built over the years based on customer requests with a special emphasis on reliability and price. As with all our engines Turnkey’s are Hot Run Tested prior to shipping. All photos of engines on this website are for general reference only. They are images of customers custom built engines and not necessarily typical of the engine you are ordering. Turnkey engines are built with black sheet metal tin. Chrome and powder coated colors are available as an upgrade option.